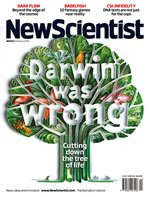 Yesterday I criticized the cover of the latest issue of New Scientist [Darwin Was Wrong?]. There's a good discussion going on at EvolutionBlog [The Trouble With Science Journalism]. I pointed out that the cover was, "an egregious example of journalistic hype and it's unacceptable in a magazine like New Scientist." I also mentioned that the article itself, written by Graham Lawton, contained some interesting—and mostly correct—information about the early history of life. Graham Lawton posted a comment to my earlier posting where he critized Sandwalk readers because they (we? ), "lack a fundamental understanding of how the media works." He was asked to explain. This is how Graham Lawton replied. I, for one, am not surprised by this "revelation." I have known for some time that decisions on titles and covers are not made by authors. I've known for some time that decisions about titles and covers can be based on "sales pitch" and "hype" and that scientific accuracy can play a minor role in those decisions. I'd like to thank Graham Lawton for explaining the process in case there are some people who still don't understand the basics. The fact that I knew how covers were selected does not affect my criticism of the decision in spite of what Lawton might think. As a matter of fact, now that I know how he was involved as senior editor I can put some of the blame on him. The fact that he defends the cover title ("Darwin Was Wrong") by saying that, "... in any case, the statement is true" is revealing. It's unusual for a science journalist to be so candid about the trade-off between scientific accuracy and "sales pitch." As for the article itself, Graham Lawton is quite proud of it. He seems to be implying that the title of the article was not his fault, thereby shifting the blame somewhat to other editors. That position is not going to stand up to close examination of the article. The first four paragraphs talk about Darwin and what he thought in 1837 and 1859 [Why Darwin was wrong about the tree of life. It will be clear to every reader that this is not just ancient history, the strong implication is that up until recently most evolutionary biologists thought just like Darwin must have thought 150 years ago. They were stuck in the late nineteenth century Victorian mindset. That's why Lawton begins the next paragraph with, "For much of the past 150 years, biology has largely concerned itself with filling in the details of the tree." That's nonsense, of course. There's a lot more that's been happening in evolutionary biology than just filling in the details of trees. Is it any wonder that the editors picked up on this false notion and created the headline "Darwin Was Wrong"? Graham Lawton, as author of the article, seems to be making exactly that point. The article would have been much better if Darwin's name had never been mentioned. Darwin knew nothing about molecular evolution and he knew almost nothing about bacteria or the last common ancestor. Dragging Darwin's name into the article serves only to confuse the readers. It's probably another example of "sales pitch" designed to sell the magazine. It may not be only editors who are guilty. Graham Lawton posted a comment to my earlier posting where he criticized Sandwalk readers because they (we? ), "lack a fundamental understanding of how the media works." It seems to me Lawton has mistaken lack of approval for lack of understanding. I wonder how Mr. Lawton feels about his article and its marketing, given that it has already been used by creationists in support of changes they've gotten into the Texas science standards that are harmful to science education not just in Texas but, because of the marketing of textbooks, potentially throughout the United States? Mr. Lawton knows full well how dumb creationists can be. He knows that, for instance, when creationists hear something like "Cambrian Explosion", then to them it means that the Cambrian "exploded" in about the time it takes for a real explosion, like, you know, firecrackers and balloons and stuff. He also knows creationists go around saying the precise exact phrase "Darwin was wrong" all the time. He knows what it sounds like to a creationist when somebody says "cutting down the tree of life". He also knows that "Johnny" doesn't "lack a fundamental understanding of how the media works." He knows a whole lot of stuff he pretends like he doesn't know. Gimme a break dude. Thanks for pointing that out John. I'd be interested in hearing Graham's response. I subscibe to the NS and got my hardcopy yesterday. I've read the cover, the reference to it in the editorial, and the article itself. It seems clear to me that the NS knowingly published the issue with a controversial cover - but while this was only a mild 'teaser' in the UK (where Creationism is a minor irritant) I can also see that in the US (where Creationism is a major plank of a religious and political movement) the cover was arguably unnecessarily provocative. Much like the earlier Scientific American cover 'Was Darwin Wrong?'. In the end the NS and the SA are both 'entertainment' by science reporting. There has previously been some heated debate about the 'fast, shiny, new car' adverts in the NS which seem to run against the global warming/pollution science stories. Again the 'explanation' was that the advertising content (which generates some of the revenue supporting the publication) was sold outside the control of the editorial staff. If anyone feels that the NS cover was truly inappropriate then they shouldn't buy the issue, or they could cancel their subscription. I know I shall be watching the web correspondence and letters pages with some interest. At the moment my feelings are that it is better to debate apparent challenges to established science, rather than to appear to support a specific 'party line'. Who knows - some creationists might start to ask themselves questions about their understanding of evolution? Of course I don't live in the USA. I've been a New Scientist subscriber for about 20 years. I still enjoy many of the articles, but I'm getting seriously fed up with all this hype. I'm seriously considering not renewing my subscription. "It seems to me Lawton has mistaken lack of approval for lack of understanding." This is a wonderful quote! May I have it (minus the Lawton reference)??? "mistaken lack of approval for lack of understanding". I'm going to paste it on our refrigerator in huge letters. I needed this today. What a depressing episode. Lawton's argument is really rather feeble. Darwin was largely right; what has happened to his theory since publication is that is has been improved, incorporating elements that he couldn't have known about. How about "Lawton was Wrong" for thecover of the next issue? There’s a lot I don’t understand, but the intent of the cover page isn’t one of them. I posted a reply to Lawton at my blog; and linked it back to here. If you get a chance take a look – thanks for the defense in my absence! How about "Lawton was Wrong" for the cover of the next issue? Galileo claimed that Jupiter had 4 moons when it actually has over 63! This would be on an intellectual par with the "Darwin was wrong" cover. Since Mr Lawton is here I have one question. Both he [Bapteste] and Doolittle are at pains to stress that downgrading the tree of life doesn't mean that the theory of evolution is wrong - just that evolution is not as tidy as we would like to believe. Some evolutionary relationships are tree-like; many others are not. "We should relax a bit on this," says Doolittle. "We understand evolution pretty well - it's just that it is more complex than Darwin imagined. The tree isn't the only pattern." You cant have it both ways. Either there is no evidence at all that the tree of life is a reality, or some relationships are tree-like, and the tree isn't the only pattern, meaning that is it a pattern. Now the first quote is the money quote isn't it. That's the one that probably hooked the other editors. So, does Bapteste hold two contrary views? Or was the first quote talking about his work with HGT specifically, and the context lost in translation? This is a wonderful quote! You've never raised a teenager? For some reason the New Scientist seems to cross the Atlantic faster than it crosses the English Channel, so I often find people in North America commenting on articles before my own copy has arrived. So it has been on this occasion, and most of the important points about Graham Lawton's disgraceful article had already been made here and on other blogs before I was able to read it for myself. However, there are one or two things that don't seem to have been said. One of them is a splendid example of what Richard Dawkins calls the argument from personal incredultity, when Donald Williamson is quoted as saying that "I can't see how one animal with one genome could do that [where that is to separate into appty two independent individuals with quite different phenotypes]. I think the larval genome and the adult genome are different." Well maybe, but if so there is a simple solution, to do some genetic studies of the two forms. Perhaps he should read Denis Noble's The Music of Life, where he will be reminded that the 200 or so cell types in a human all have the same genome but very different properties. More to the point, the whole idea that examples of lateral transfer call the tree of life into question is absurd. Does anyone claim that real trees (the sort that have leaves and collapse when too much snow piles up on them) don't really exist any more, now that we know that they live in symbiosis with soil fungi, and communicate with one another? Do any linguists claim that Jones was wrong about the existence of an Indo-European family, because many languages (most notably English, which has a huge proportion of words of French origin) borrow heavily from others? Do any of them claim that English cannot be regarded as a Germanic language? The total refusal of Graham Lawton to accept that by lying about science he is giving comfort to the creationists is distressing. I can only hope that he is not typical, but I fear he may be. I doubt whether many people will cancel their subscriptions because of this (because of inertia), but it would be nice if some high-profile contributors such as Lawrence Krauss (every week) and Richard Dawkins (next week) were to make their feelings known in a very prominent way. "You've never raised a teenager?" "This is NOT a debate!" I still don't understand how the tree of life metaphor is wrong. Sure, it doesn't take into consideration the recombination and horizontal gene swapping and symbiotic genome combinations that occurred a couple of billion years ago but what about prior to that? Is it not still a good metaphor for the earlier stages of biochemical replication? Its also a pretty good metaphor for later eukaryotic evolution. If we are looking for the best metaphor then it, like the development of life becomes messy (perhaps a tree that turns into a web that gives birth to a series of separate trees, whose branches, if you can examine them at the individual species level, again become webs). The whole "Darwin was wrong" thing is entirely superfluous since Darwin was unaware of genetics, and in particular, recombination. Without knowledge of these we are being ridiculously fastidious in expecting his tree analogy to be the complete story. IMHO the tree of life is a perfect metaphor. Obviously Darwin did not know all the mechanisms involved but he certianly understood the concept. These authors were just being irresponsible in order to sell magazines and get people buzzing. But guys, remember this is a British publication. We don't have a powerful creationist or loony right lobby in the UK. So your creationists might be able to quote-mine it, but that's an American problem, not a British one. It's not our fight. One facet of all of this fuss that amuses me is the focus on the guy with the big beard. When I did my biology degree in the 1970s, we did a huge amount on evolution, but Darwin hardly got a mention. We looked at the theory and the science, not at the people. Darwin was acknowledged, but only in the same way as Newton was in physics, the guy that started the field: respectful nod to a great, now let's look at the modern theory. I don't find this interest on the validity of pre-genetics theories of the 1800s enlightening. I'm glad to see that the debate has sobered up. I’m constantly amazed by the vitriol that gets lobbed around on blogs, though I don’t know why I’m amazed any more. To pick up on one of the good points raised here: obviously the ToL of the early 21st century is not identical to the one of 1837, or 1859. But the point stands that the basic concept - that the entire history of life on earth can be represented by an ever-bifurcating structure - has survived largely intact for 150 years. For example, Peer Bork’s group at EMBL are working under this basic paradigm in their bid to reconstruct a ToL from complete genome sequences. For those who do not want believe that this concept is now being sorely tested and challenged, here are some research papers. Many of them are very recent. Apologies for all the links - I want to emphasise that this article wasn’t built on a couple of dodgy papers in fringey journals. For those who do not want believe that this concept is now being sorely tested and challenged, here are some research papers. I believe you may be mistaking the direction of most of the criticism here. The "testing" of the ToL concept, or to put it another way, the knowledge of lateral gene transfer, is very old news. The criticism comes from the fact that New Scientist played up this old news as (1) some sort of shock, and (2) some sort of challenge to the theory of evolution as currently (and for at least the past few decades) understood. Neither is true. Because tree branches do not ordinarily rejoin trunks, lateral gene transfer makes a web a more appropriate metaphor (and that's all it is, a shorthand explanatory metaphor) than a tree for the evolution of organisms capable of such transfer. Datwin used the Tree of Life (once) in the first edition of On the Origin Of Species as a simile, not a metaphor. I'm afraid the part of the article referring to Darwin was sloppy journalism. To be clear, there is no suggestion anywhere in the article that what is happening to the ToL is some sort of challenge to the theory of evolution. That is one of the lazy misconceptions I've been trying to put to bed. Graham, the two major ideas of Darwin that underly a lot of modern biological thinking are common descent and natural selection. These are what Darwin is respected for in the scientific community. Outside that he undoubtedly got many things wrong - sometimes hopelessly wrong if you think of his theory of inheritance by blending. The tree of life is often used as a metaphor for common descent and the cover certainly implied that this was wrong. We've known for decades that the details are incorrect, or rather incomplete (bacterial recombination, symbiotic organelles of eukaryotes etc). Darwin was wrong about many things but common descent was not one of them. Which, as long as we are parsing things finely here, is why I was careful to say New Scientist played it up as a challenge to the ToL and thus evolution ("Darwin was Wrong" superimposed on a tree), not that your article contained such a statement. In other words, horizontal gene transfer is not as prevalent as to confuse the tree of life, in contrast to the Doolittle derive figure in textbooks. "Surprisingly, HGT also turns out to be the rule rather than the exception in the third great domain of life, the eukaryotes. " It certainly would be surprising, if that happened to be true. To pick up on one of the good points raised here: obviously the ToL of the early 21st century is not identical to the one of 1837, or 1859. You are correct that modern evolutionary theory has moved far beyond anything that Charles Darwin knew in 1859. If you knew that then why all the emphasis on Darwin in your article? But the point stands that the basic concept - that the entire history of life on earth can be represented by an ever-bifurcating structure - has survived largely intact for 150 years. 1. The history of life is NOT the same as the "Theory of Evolution." The fact that you seem confused about this is not comforting. 2. The idea that most of the history of life can be represented by a tree-like cladogram is still as valid as it ever was in spite of what you might think. The fact that the earliest history might be obscured by lateral gene transfer is extremely interesting but it's more like the exception that proves the rule than a complete overthrowing of everything we knew. Finally, I don't know what you're trying to prove by posting all those links. Most of the people who are criticizing you—including me—know far more about this stuff than you do. I'm really shocked at the vitriolic comments against Graham Lawton here. People in the public eye, including writers, accept that they will come under scrutiny and that others will attack them. However the internet has made this a lot, lot nastier. Would you say these things to someone's face? Some of the commenters here should be ashamed of themselves. I'm really shocked at the vitriolic comments against Graham Lawton here. Would you say these things to someone's face? That they're wrong and then explain why? Absolutely. Because "Darwin" is shorthand for "Theory of Evolution" in the minds of many (most?) members of the public, a fact exploited by IDiots when they flog (perceived) shortcomings of 150-year-old science and seek to make people believe it's relevant to the present by calling it "Darwinism." To paraphrase one of the basketloads of comments on the article that I've read on this and other blogs, if a magazine cover said "Jupiter has more than 4 moons" it would be yawn-inducing, but one that announced "Galileo Was Wrong" might catch more public interest.